With a 3pm kick off. FFS, 3 months before the game? Good...no more home games on Alba, only away games. That'll keep The Jersey Boys happy. Some need to make arrangements. I have arranged to stay in the house and watch the Super Saints hump the Ton on the Telly. I'll post nearer the time I'm fizzing about something or other and I cant make it. Jimmy H comin up for the Morton game at the end of this month. Just sent him a message sayin "Morton game live on Alba! ".....wee scamp that I am. Don't think scamp is the word I would use. Does anyone know if this is pay at gate. Had to go back a few pages. I'll rephrase - does anyone know if this is all ticket. Won't know til nearer time if I'm able to go and because of holidays ticket office will be shut. Doesn't say in that news item. Its all ticket as they have these machines at the gates but not ALL ticket, no pag. This is going to be so fecking easy. Just like New Years Day 1977. 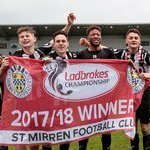 Morton 1-2 St Mirren.....................or Morton 1-1 St Mirren. As it's only Shull, at the minute, saying it will be easy that doesn't count as a "view", more another ramble. Blimey Ricky!! Those must be some pretty special family commitments to tarnish a record as impressive as that! Blimey Ricky!! Those must be some pretty special family commitments to tarnish a record as impressive as this HTML class. Value is that! All my own fault. I arranged to take the family for a meal. Had thought that the time was changed with the game being live on TV....dumb.